Annual Philanthropy Bunco Event: Wednesday, April 17, 2019. Why do we celebrate Badge Day? Fellowship, leadership and a lifelong commitment to community service are the daily themes in the lives of sorority women — from our college members to alumnae. On the first Monday in March, these women — who number in the millions — will celebrate International Badge Day during National Women’s History Month. On that day, all of us will honor our separate and distinct Greek-letter affiliations by wearing our badges or letters. It’s a day set aside to acknowledge successful women around the globe, whether they are U.S. senators or university freshmen working for humanitarian aid in far-away continents. 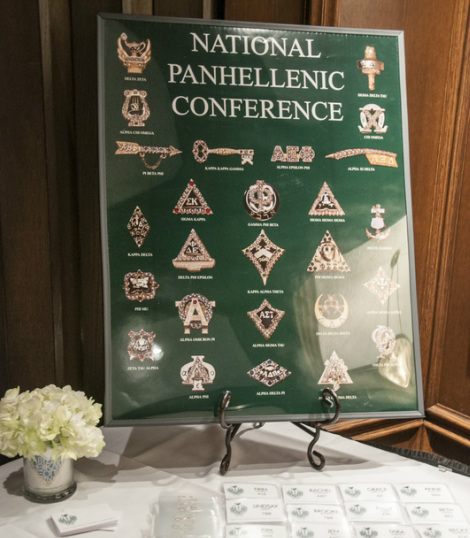 The National Panhellenic Conference, one of the largest and oldest women’s organizations in the world, is not alone in celebrating and acknowledging all that women do. Other groups, such as the National Association of Latino Fraternal Organizations and the National Multicultural Greek Council, celebrate in their own diverse ways to recognize women. Each group is distinct in its fraternal bonds, and each will celebrate in different ways. But all will be celebrating the diverse interests of women. On the first Monday in March, campuses and chapters across the globe join to celebrate achievements in science, community, government, media, literature, art, sports, medicine — and those female leaders who have had an impact on the development of self-respect and new opportunities for girls and young women everywhere.